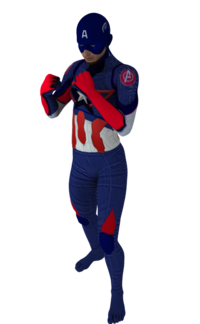 Cap America age of ultron 2nd skin textures for M4. Resources for Captain America renders (any variety - see the link for a list of various versions of Cap). Note that these should be used for non-commercial works only, unless you happen to be the creators of the works these freebies were based on. Captain America and associated character names are trademarks of Marvel Characters, Inc., which does not sponsor, authorize, or endorse this site. This page was last edited on 18 March 2019, at 05:32.